MERCERSBURG - James Buchanan's girls basketball team pulled down offensive rebound after offensive rebound on Wednesday night. But the problem for the Rockets was they didn't actually capitalize on many of those second-chance opportunities. Until the last second that was, and JB picked up a 50-48 non-league victory over Southern Fulton. "We definitely talked about it at halftime," Rocket guard Rachel Martin said. "A lot of that was on me because I missed a bunch in the first half, but that's one thing I focused on in the second half." With less than five seconds to go, JB's Charity Miller threw up a shot that rimmed out. Cassidy Martin tipped the rebound over to Rachel Martin, who banked it in for the win. "As soon as (Charity) shot it, I thought maybe I could get a last-second rebound," Rachel Martin said. "Cass hit it, though, and I just tried to get into the middle. When it came to me, I knew I had less than a second to go, so I just tapped it right back in." Rockets coach Jen Lauthers said, "You couldn't have it any better person's hands than Rachel Martin. She crashes the boards, offensively and defensively. She's a guard, but she's our leading rebounder, and I'm just glad it went in." With just over five minutes to go, Southern Fulton (16-5) held a 45-38 lead after going on an eight-point run that featured back-to-back 3-pointers from Shaye Smartt and Laykn Morton. But the Rockets (11-11) slowly but surely chipped away it. 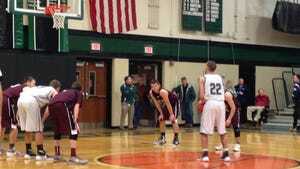 James Buchanan even took a lead on a Miller layup with under two minutes left in regulation. But Southern Fulton tied it right back up with a pair of free throws from Drew Gordon, setting the Rockets up with a timeout and 1:15 to work with. "During that timeout, I asked if they wanted to hold it for the last shot, and they said yes," Lauthers said. "We just ran our regular 2-3 offense and tried to get a swing or a drive. We didn't have a set play at the end. By luck, it was in Charity's hands at the end. She took the shot, and Cass got the tip. I thought it was gonna roll around and come back out, because that's what happened to almost all of our offensive putbacks in the first half." Southern Fulton coach Meagan Raville said, "It didn't come down to the last minute or even the last shot. It came down to mistakes that we made throughout the ball game. It was a team loss; you win as a team and you lose as a team, but it wasn't one missed rebound that lost us this game." The Indians got a big game from Olivia Mottern, who finished with 21 points and 13 rebounds. But no other SF player scored more than eight points. The Rockets, on the other hand, had three players finish in double figures - Rachel Martin led the way with 15 points, while Miller followed right behind with 14 and Tristen Amsley scored 13. Celina Merchant 4 0-0 8, Lakyn Morton 2 0-0 6, Shaye Smartt 2 0-0 5, Olivia Mottern 7 5-6 21, Drew Gordon 1 2-2 4, Emily Bradshaw 0 0-0 0, Drew Hann 0 2-2 2, Maddie Baker 1 0-0 2. Totals — 17 9-10 48. Charity Miller 6 0-0 14, Madison Martin 0 0-0 0, Rachel Martin 4 6-11 15, Nina Shatzer 1 0-0 2, Tristen Amsley 6 0-0 13, Cassidy Martin 1 0-0 2, Aspen Anderson 2 0-0 4. Totals — 20 6-11 50. 3-point goals — SF 5 (Morton 2, Mottern 2, Smartt), JB 3 (Miller 2, Amsley).